More and more frequently, large software providers are carrying out audits of their customers in order to uncover license misuse through improper licensing or under-licensing. Carefully monitoring license use doesn’t just allow you to significantly reduce business risks; proper license management software also provides you with a useful tool for investment control and cost reduction. Market research institutes have found that 23 percent of all newly purchased software isn’t actually used. The total value of installed unused software averages $400 per computer. Recognizing license errors and over-licensing with active license management often uncovers huge potential cost savings. License violations pose a risk to all businesses. Automated license management provides you with full transparency regarding your current license inventory and its actual use. You can be sure that there’s no unlicensed software in use in your company thanks to the monitoring of unapproved software installations through automated license management. Activity-based billing of software licenses provides a great deal of potential to lower costs. Automated license management, a component of Matrix42 License Management, allows costs to be determined in an activity-based manner, and bills licenses to the departments that have ordered them. An end user installs Adobe Flash Player after downloading it from the Internet without asking the IT department about it or going through an approval process. The unapproved installation is automatically registered by Matrix42 License Management. Furthermore, the license requests are identified, and the license administration is informed about the installation. The approval and removal workflows pre-defined in Matrix42 Workflow Studio enable governance processes defined at the company to run automatically in the background. Always keep an eye on which software products are being used in your company – on devices, in the data center, on virtualized servers, or in the cloud. Always maintain an overview of whether these are full versions, rental extensions, or maintenance. 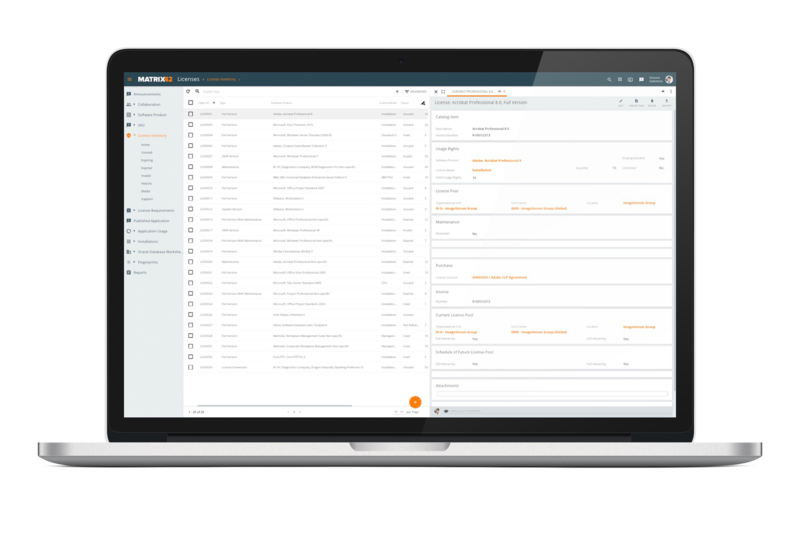 Matrix42 License Management makes it very easy to keep an eye on license inventory and needs, proactively save on costs, and minimize risks. Automate your business processes very easily via drag-and-drop. 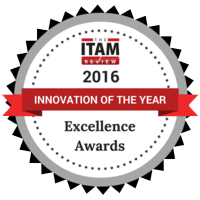 According to the ITAM Review, Matrix42 offers the first ITSM suite to also incorporate fully integrated enterprise-grade IT asset management, and was named “Best in Class” for this reason. KPMG Deutschland has confirmed that, in 2015, Matrxi42 Asset Management software received a 100 percent rating in all test categories and includes all the necessary functions and software catalog contents required to support companies in the area of software license compliance. 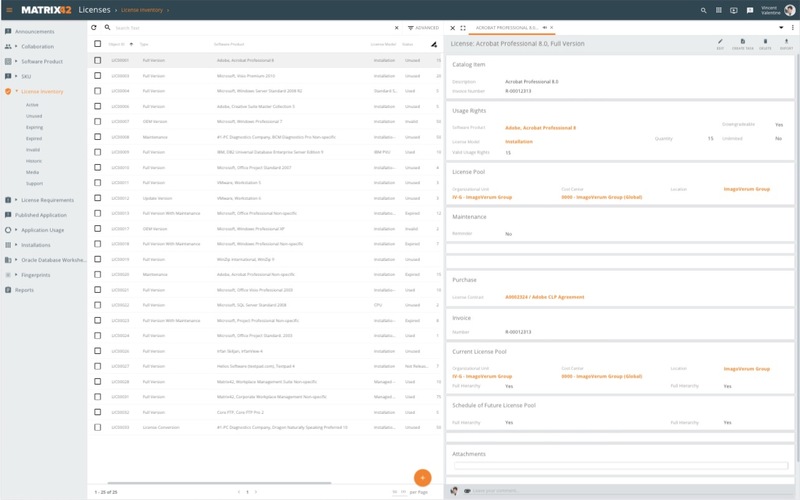 Software Asset Management and MyWorkspace enable companies to provide secure workplaces for users to increase productivity and simultaneously manage licenses, compliance, mobility, and software-as-a-service (SaaS) within the cloud. All Matrix42 Software Asset Management modules are integrated with one another and can be used in a complete management console. Matrix42 Workflow Studio lets you dock the systems of your choice in a completely intuitive way. SolutionBuilder allows you to design the entire UI as desired. SolutionBuilder and Workflow Studio provide you with a whole range of options to expand your solution in an update-proof way. Maintain an overview of your license conditions and license needs – in a simple, compliant way. Manage your assets and licenses as well as all of your suppliers, agreements, and contracts. Inventory all of the assets in your network in an automated way. Keep an eye on all of your software and hardware assets as well as non-IT assets. A magical database that brings your commercial and technical data together. Model and automate business processes via drag and drop. Adapt Matrix42 Service Management to your needs in an update-proof way. Convenient self-service access for mobile users to their own workplace. Manage the licenses for your (SaaS) applications very easily in the cloud. Oracle databases in the data center. Transparency regarding all hardware and software for all platforms in your data center. Matrix42 Software Asset Management services can be supplemented through add-ons available for purchase, such as the Datacenter and the Oracle Compliance add-on. … about license compliance, license management, contract management, asset management, and CMDB. Learn how to keep track of the licensing jungle in this white paper. Mastering the own data, thanks to automation! Find out how KWS Saat SE got a grip on its data - thanks to Service Management from Matrix42! Read how the NGD Group was able to inventory all devices.